Am i eligible for IBPS after completing 12th with 48% and pursuing B.Com now? Am i eligible for banking or other jobs after pursuing graduation without completing 10th and 12th? Am i eligible for the post of Sub Inspector being a B.Com degree holder? Can i get a job in government sector or in Banks as i have no certificates of 10th and 12th but pursuing 2nd year B.Com? Am i eligible for job in banking or any other government sector as i left studies after 8th standard and going to complete B.Com degree from Yashwant Rao Chavan a UGC approved? PG courses for B.Com students in Science filed? Can i do Logistics management? Scope of doing it? Related job and job guarantee after this course? Re: Am i eligible for IBPS after completing 12th with 48% and pursuing B.Com now? 12th pass outs are eligible for the clerical post. But a minimum of 50% is a must in the same. So you are not eligible for this exam. You can probably apply after completing graduation. You will be eligible for both the clerical as well as probationary officer post. Also you should be over 20 years to apply for PO exam. You can start preparing for the exam now. You must start preparing for the general awareness section especially. You must be well updated on the reforms in the banking sector. No Friend,am sorry to say this you are not eligible to write the IBPS exam why because your percentage in Intermediate is very poor.It must be at least 55-60% if you want to write. But you have a chance if you complete the degree with at least 60% of marks. * A citizen of India. For PO Exam : 21-30 years. * For Clerk: Tenth or Inter with 55-60% of marks. 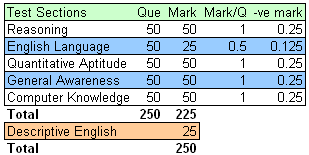 For PO Exam: Graduation with 60% of marks. The following are the eligibility criteria that a candidate have to apply the IBPS Clerical exam. Selection will be totally based on Merit. -->>You can apply in IBPS clerical exam if you have 60% in your 10th or in 12th. -->>As you have not secured 60% in 12th so if you have secured 60% of marks in aggregate in 10th or High school exam then you can apply in IBPS clerical exam. -->>After completion of B.Com degree you can apply for the posts of Probationary officer and Clerk. Nationalized banks are conducting recruitment through IBPS(Institute of Banking Personnel selection). A common entrance examination for these nationalized banks i.e.IBPS exam. -> Should have age in between 18-27. There will be age relaxation of 3 yrs for OBC candidates, 5 yrs for SC/ST candidates. You are eligilble for IBPS because they only require graduates specialized in any stream. But the employment eligibility in public sector banks will depend upon Valid IBPS score card and bank's eligibility criteria. You are eligible for IBPS doesn't mean that you are eligible to work in any public sector bank. Every bank has its own selection criteria. If you belongs to general category then it will be a little mess but if you belongs to reserved category then there is a chance of employment eligibility in Banks. but for the Sc/ST : 45% marks . For the OBC: 50% marks ..
For the Sc/ST : 45% marks . Age limit: age must be between the 19 to 28 years . For Sc/St" 5 years age relaxation..
on the basis of the your marks in the IBPS exam you can apply for the interview in the respective banks for the interview and GD.. The following is the eligibility creteria that a candidate have for applying to the IBPS exam. -- You must be a citizen of India to apply for the examination. -- Must have completed your 10th with 60% (or) 10+2 with 50%. A person who is pursuing his final year in degree is eligible for IBPS Exam, in order to apply for the exam u need to complete your degree or else pursuing final year so please do wait. So u need to have the above mentioned qualification. you can either apply for banks separately or you can write a commont entrance i.e IBPS. Yes, you are eligible for IBPS PO exam definitely as it require graduation which you are. I give you a complete details on Educational Qualifications require to apply for IBPS Clerical Cadre Exam. You have to check below Educational Qualifications according to your category . You didn't mentioned about your category and 10Th Standard Percentages any way please check below educational Qualifications. Here is the good news news for you,that is you are eligible for IBPS exam. But friend, after passing the said exam the individual banks require Minimum 50% or 60% marks in 12th as per there notification. You can apply in IBPS Exam but you may face the problem after qualify the examination regarding marks. Graduates who are with in the age limit can also apply for the clerical examination..
i have pursued my sslc with 78% and puc with 48% am i eligible for IPBS clerk Exam?